Arthur Tutty was the youngest son of Mr and Mrs James Tutty J.P. of “Inverinate”, 4 Christchurch Rd. James Tutty had already died at the time of his son’s death. 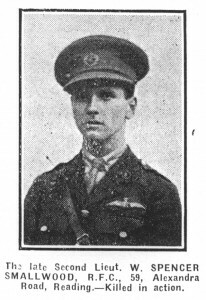 Arthur died on the 24th June 1916, aged 23. The circumstances of Arthur Tutty’s death were particularly unlucky. The Reading Standard of 8th July 1916 gives an account of the circumstances. The details are taken from a letter sent to his mother. “Lance Corporal Tutty was severely wounded in the lower parts of his body and one leg was shattered. 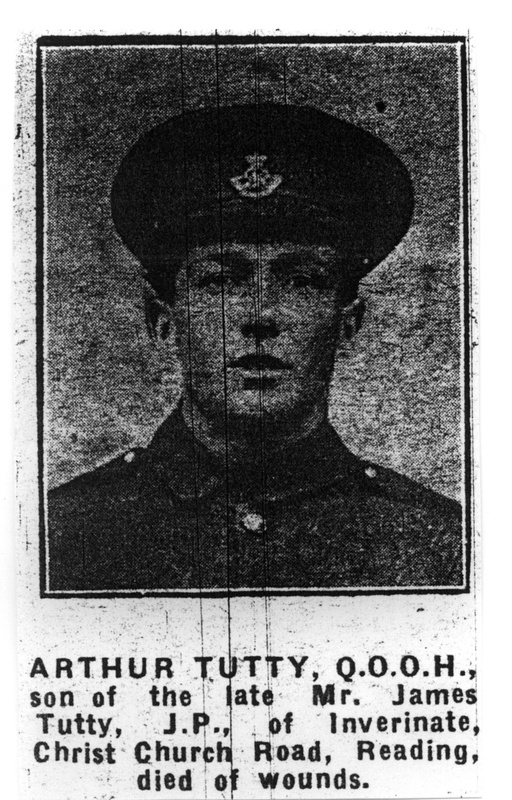 He was in billets at the time, for two days’ rest behind the firing line, and was walking to the canteen with several other men when a stray shell exploded and left his comrades unhurt.” Arthur Tutty is buried in Bailleul Communal Cemetery Extension II. E. 157. 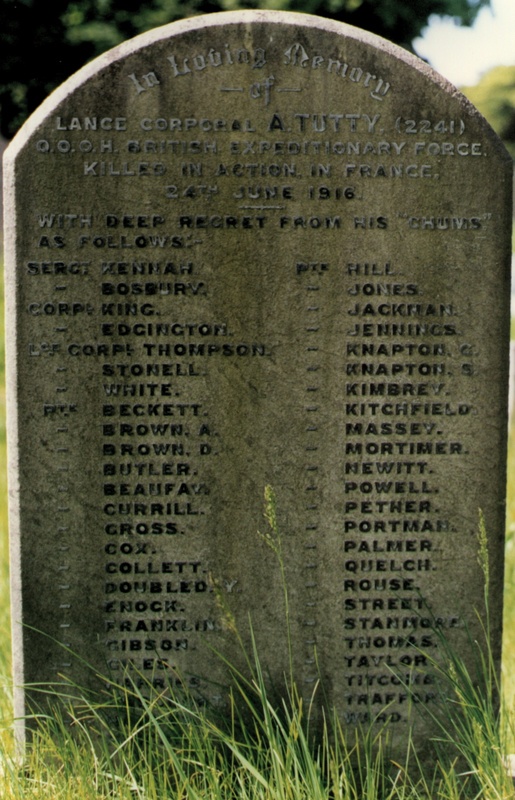 A memorial to Arthur, paid for by his chums, who held him in high esteem, and bearing their names, was placed on his father’s grave. Arthur Tutty had been educated at York House School, Reading and Reading Collegiate School. He had a liking for the out door life and had gone to Canada as an apprentice farmer. He had been in Canada for two years but returned when his father was taken ill. However, he had continued his training on the land. Arthur was well known in Reading athletic circles. He was a good all-round sportsman, like his brothers he excelled in football and cricket. 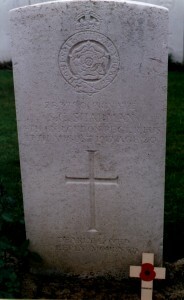 His officer, writing about his death, said: “He was as brave as a lion, a splendid soldier, and one that could be least spared; he could always be relied upon to carry out the most difficult tasks thoroughly and exactly as instructed, and, above all this, was a perfect gentleman.” He had many friends. Arthur Tutty was expecting to get home leave at the time of his death. The Queen’s Own Oxfordshire Hussars were part of the British Expeditionary Force and had the distinction of being the first Territorial (Yeomanry) Force to embark for France as the Cavalry of the Marines Division. The Marines were the baby of Winston Churchill who was First Lord of the Admiralty and his family had been associated with the Hussars for more than a hundred years. On 3rd October 1914 the Hussars were the only British force standing between the Germans and the sea, the Marines had been ordered to Antwerp. The action there resulted in the small Belgium army escaping to fight another day although the town itself fell to the Germans. After the action the Royal Naval Division was withdrawn and the Q.O.O.H. were recalled to England. However, the officers of the unit, having enjoyed chasing German cavalry were reluctant to leave and all but mutinied. They sent representatives to see the Commander-in-Chief Sir John French, pleading to be allowed to stay. French liked their cheek and explained that whilst he could not absorb them into the official fighting force as they were not part of the official BEF, he would allow them to stay as guards for the HQ in St. Omer. By the end of October 1914 they found themselves in action at Messines Ridge in the First Battle of Ypres. 22nd Squadron Royal Flying Corps and General List. 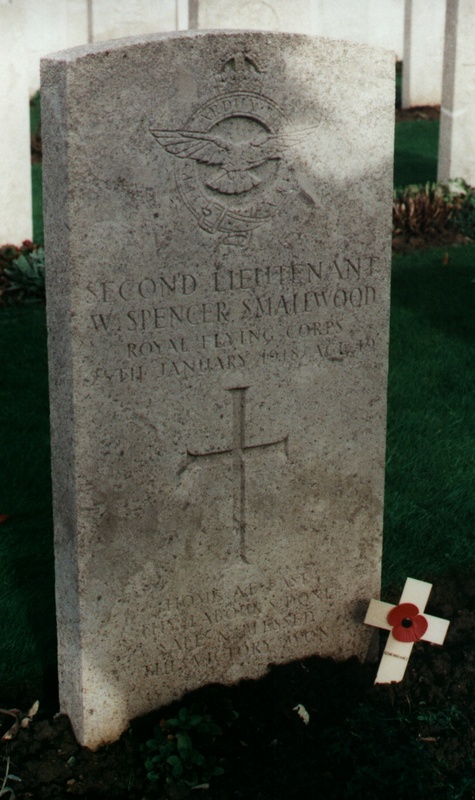 William Smallwood died on 25th January 1918, aged 19. He was the son of William and Ellen Rebecca Smallwood, of Knaresborough Lodge, Alexandra Road, Reading. He is commemorated on the family grave. Number 16384. The inscription states that he was killed in action and interred at Lapugnoy Military Cemetery. The grave location is VIII. A. 13. The site of Lapugnoy Military Cemetery was chosen in 1915 in preparation for the British offensive which took place in September around Loos. Further burials, in great number, took place in 1917 during the Battles of Arras. The dead were brought mainly from casualty clearing stations but in May and August 1918, fighting units used the cemetery. 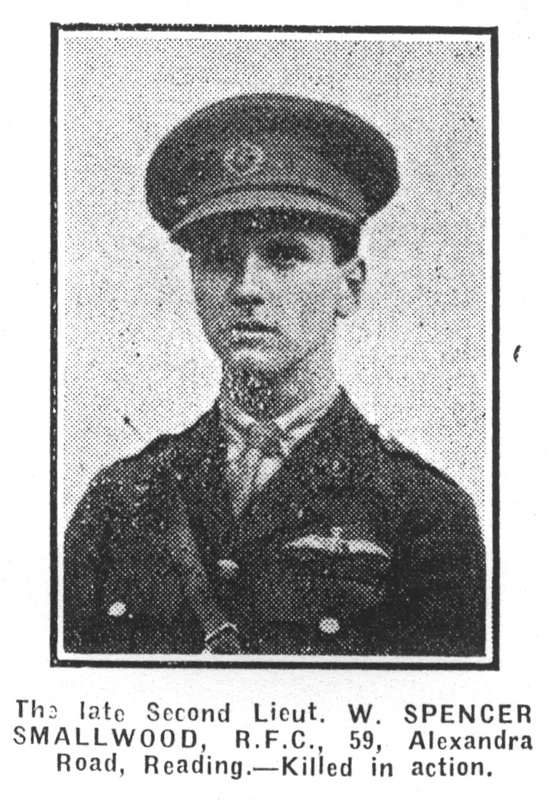 The author does not known exactly what action William Smallwood was participating in when he was killed but in the days before his death and on the day he died there was a great deal of aircraft activity and bombing action in the Flanders and Northern France. The 1911 census indicates that the family consisted of two sons and a daughter. It is believed that William’s brother lived into his eighties and may have spent some time in Canada or the USA. Stanley Sharman was the youngest son of Frederick and L. E. H. Sharman, of 68, Liverpool Road. 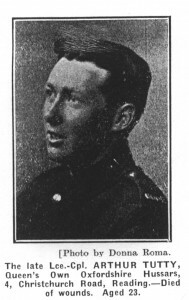 His father was serving in the Royal Army Medical Corps., and his brother Lance-Corporal Sharman was about to receive a commission at the time of Stanley’s death. Prior to the war Stanley had been an apprentice at the Berkshire Printing Company. 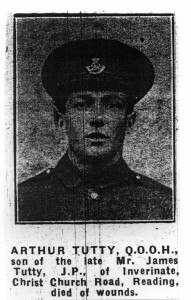 The details of the death of Stanley Sharman were published in the Chronicle of 31st August 1917. 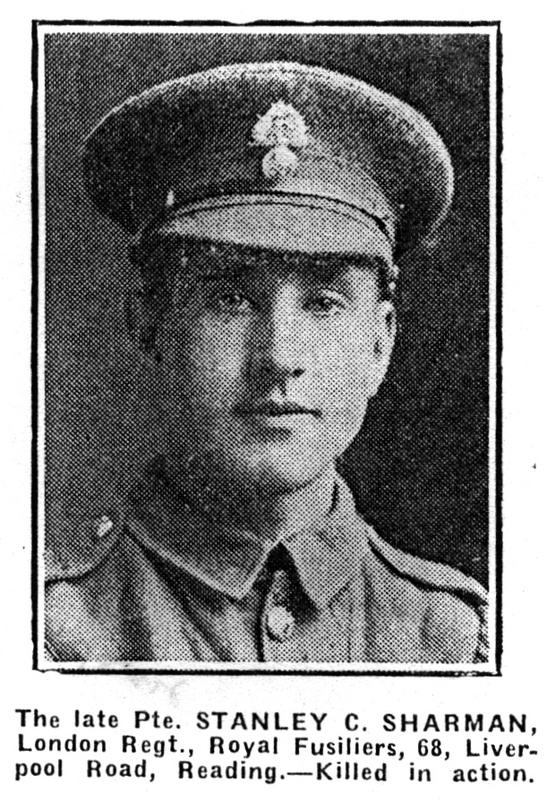 Private Sharman had been a stretcher bearer and died of shell wounds received on August 16th whilst administering water to a wounded comrade. “He was such a gallant fellow, always prepared to help his wounded comrades, regardless of the danger”. 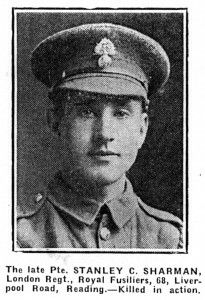 He died of wounds on 17th August 1917, aged 20 years. 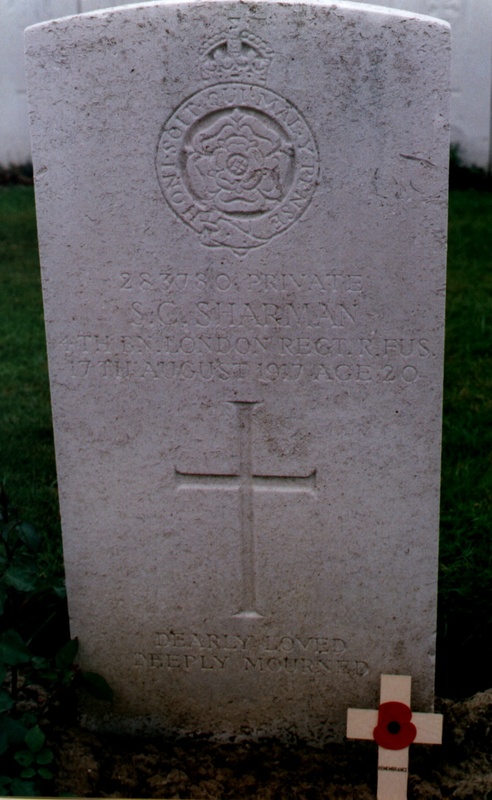 Stanley Sharman is buried at Mendingham Military Cemetery, Belgium. Location III. F. 8. His name also appears on the Reading YMCA memorial.